Around 3,000 people in the UK and Eire have multiple system atrophy, which leads to premature death – currently there is no cure. That’s why we’re asking people to show their support by hosting a tea party. It couldn’t be easier – invite your friends and family, keep the tea flowing, spoil your guests with sweet or savoury treats and ask for a donation in return. The money you raise will help support our MSA Nurse Specialists. 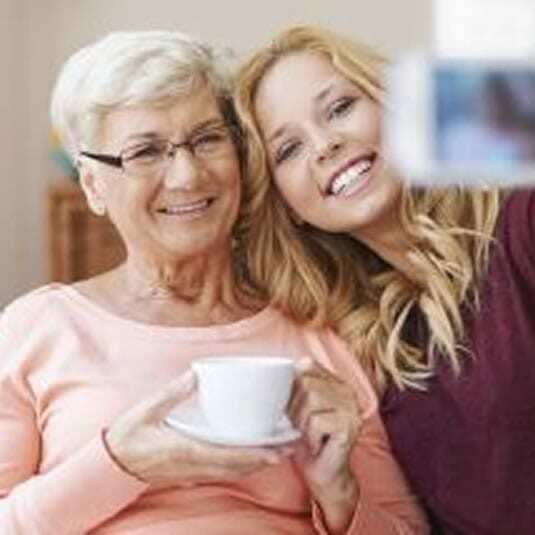 The Nurses provide telephone and email support services for people with MSA, attend a network of local Support Groups around the U.K and Eire and offer training and support to health and care professionals. 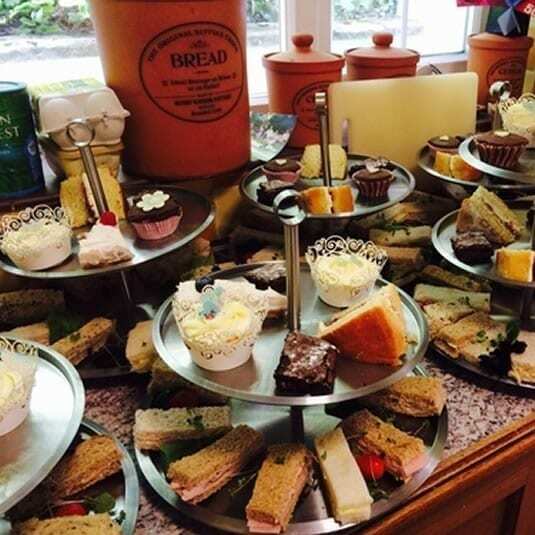 So go ahead and host a Tea Party and you will enable us to continue to provide this vital service. We really couldn’t do it without you. Thank you in advance for your support. If you would like your free Tea Party Starter Kit then please fill out the form below. This year our kit have complimentary tea bags from Bird and Blend Tea Company. They are on a mission to spread happiness with tea! They are a small, independent, award-winning unique Tea Mixology company. With blends ranging from Rhubarb & Custard to Dark Choc Chilli Chai, they’ve got something for everyone! We are ever so grateful for the contribution. 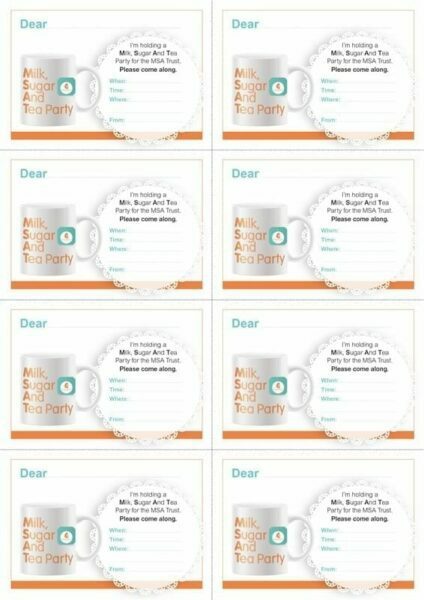 When do you want to host your Tea Party? What sort of Tea Party are you planning to hold? Is there anything else you would like to tell us about your Tea Party? If you have already received your pack, you can download extra materials by going to our Fundraising Materials section. 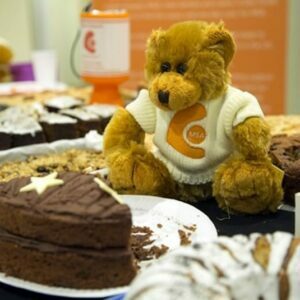 If you wanted to open a fundraising page where your guests can donate towards your Tea Party, you can click on ‘Start Fundraising’ below. 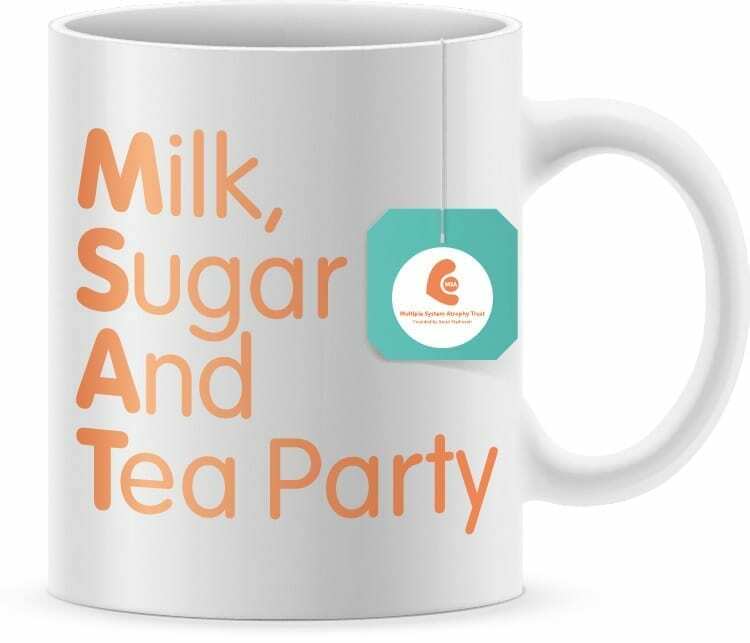 We are asking you to host a Milk, Sugar And Tea Party on or around World MSA Day, 3 October, to raise awareness and much needed funds to deliver the Trust’s vital MSA Nurse Specialist Services. There is no remission from MSA: 80% of people with MSA are wheelchair bound within five years, while research from The North American Multiple System Atrophy Study indicates that the average lifespan after the onset of symptoms is just seven years. A person with MSA experiences swift and progressive disability resulting in a reduced quality of life. They will have an inability to swallow solids; falls resulting in broken bones and hospitalisation; vocal chord paralysis and total incontinence. Pain is a significant symptom and adds greatly to emotional suffering and disability. Intellect is not affected, effectively trapping the person in a body which in all other ways is slowly shutting down. 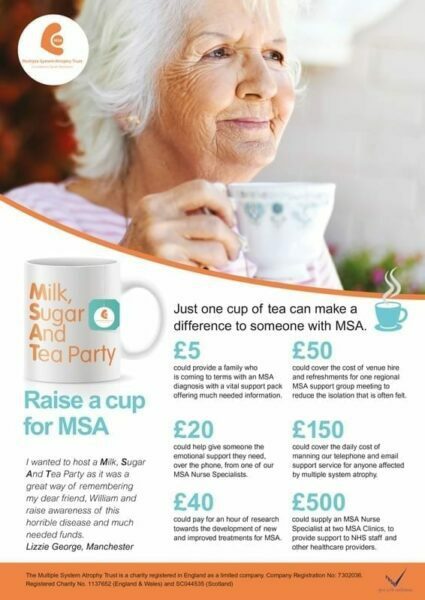 Just one cup of tea can make a difference to someone with MSA. 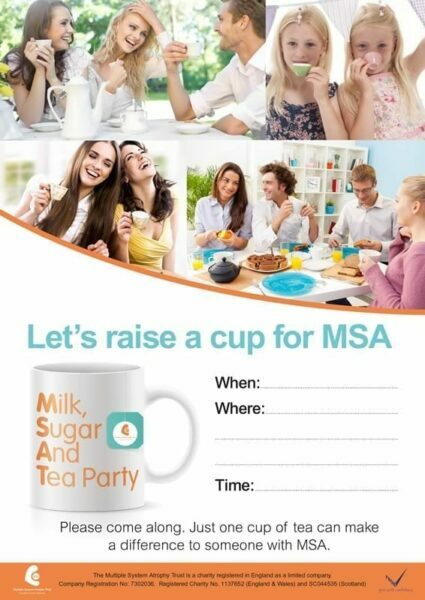 You can do something right away to help people living with this debilitating condition – have a Milk Sugar And Tea party and raise funds for our vital MSA Nurse Specialist service. While there is no known cure for MSA, our nurses help the to manage the symptoms as best as possible. They are a life line to a person with MSA. Thank you for supporting the MSA Trust as we stand united, on World MSA Day, in our fight against MSA. Hosting a Milk, Sugar And Tea Party is a great excuse to get together with family, friends or work colleagues for a good old fashion catch up over tea and cakes. 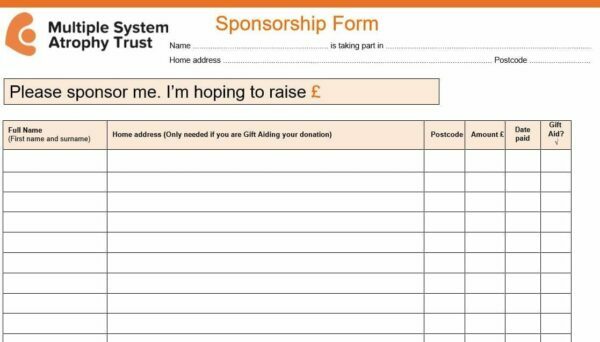 After you’ve signed up, we will send you a free fundraising pack (plus you can download or order any extra materials you need). Below is a checklist to help you host a memorable event, and raise money. 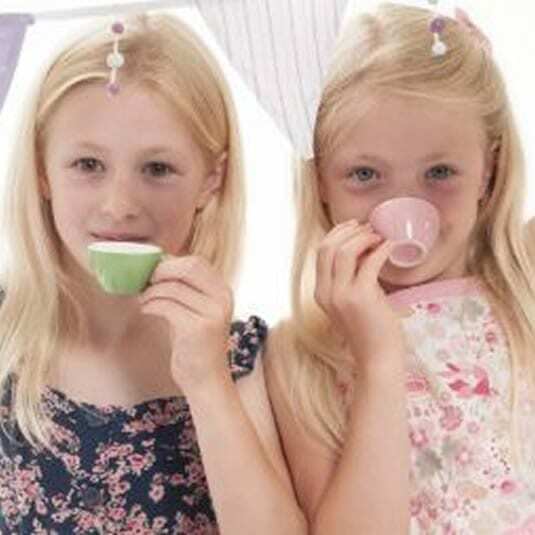 If you have any questions about planning your tea party, you can email us or call 0333 323 4591. If you would like some more fundraising resources, you can download any extra materials below to help make your MSA Tea Party a success. You can order extra balloons and cardboard donation boxes by sending us an email. Don’t forget to visit the MSA Trust shop to order mugs, t-shirts and/or wristbands. All of our recipes come courtesy of our sponsors at Bird and Blend Tea co.
With just a few easy steps you can make our Strawberry Lemonade tea into a delicious and refreshing sparkling iced tea. Add a little vodka and you have the perfect summer cocktail! The best bit? This recipe has no added sugar and (apart from the alcohol) is practically calorie free. Healthy cocktail heaven! 1. Brew your Strawberry Lemonade for at least 4 minutes. Sweeten with sugar/honey if desired. 2. Strain and place in the fridge to cool. Alternatively, you can put the steeping tea in the fridge overnight and strain tomorrow (for an extra strong taste). 3. Slice lemons and strawberries. 4. When ready to serve pour 1/2 tea, 1/2 sparkling water over a glass full of ice and garnish with slices of lemon and strawberries. 5. Add 50ml vodka or gin p/glass for tea cocktail. Climb through the wardrobe with this delectably other-worldly cake creation! Perfect with a big mug of your fave Turkish delight brew! 1. We’re going to start by infusing our butter with our wonderful tea! Melt your 250g of unsalted butter in a saucepan on a low heat and throw in your 5 Perfect Tea Spoons of Enchanted Narnia. Keep this on a very low heat for 15 mins, stirring occasionally, to make sure it doesn’t burn! 2. Remove the pan from the heat and leave on the side for a further 10 mins. Then pour it through a sieve to remove the tea leaves and set aside to cool to room temperature and firm up – you may want to do this the night before! 3. Now for your tea-infused raspberry swirl! Brew up 3 Perfect Tea Spoons of Enchanted Narnia in 150ml of boiling water and leave to brew for 4 mins. 4. Into a small saucepan, add your raspberries, 1tbsp of caster sugar and your 150ml of Enchanted Narnia concentrate! Heat on a medium temperature for approximately 15 mins – until your fruit has turned to a lovely red mush! 5. Strain the seeds out of the raspberry swirl and leave to cool on the side. 6. For your cake, through your non-infused butter (or baking spread), sugar, eggs, flour, baking powder and vanilla into a bowl and beat with an electric whisk until just combined – don’t forget the scrape around the bowl with a spatula! 7. Divide your mixture in half and pour into 2 greased and lined 20cm round cake pans. Add on dollops of your raspberry mixture and swirl it on top until you’ve got a rippled masterpiece! Bake this for approximately 25 mins at 180C, or until a sharp knife inserted into the middle of the cake comes out clean! 8. While your cake is cooling, it’s time to mix up your buttercream! Add your room temperature tea-infused butter into a large bowl and beat it with an electric whisk for about 2 mins, until it starts to become fluffy. 9. 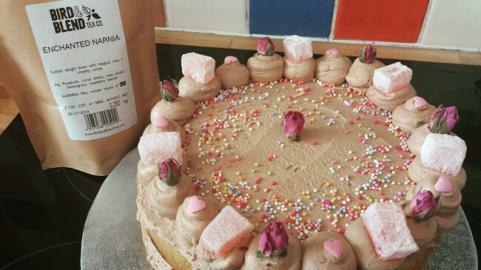 Add in your icing sugar, cocoa powder and vanilla extract and continue to beat with the electric whisk. If you feel like your mixture is too thick, thin it out by adding a dash of milk. 10. Now you’re ready to assemble your cake! Add a big dollop of buttercream in between your cakes and if you feel like it, throw in your raspberry jam! Then sandwich the cakes together and top with more buttercream. If you’re feeling extra adventurous, top it with your favourite rosy treats – Turkish Delight, rosebuds and sprinkles! 11. Enjoy with a cuppa! Or even better, with an iced Enchanted Narnia latte! We had a blast at all of our launch parTEAs! 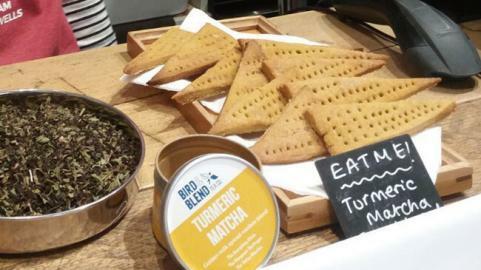 We’ve had a lot of requests from some of our Brighton bound Teabirds for the recipe of our delicious Tumeric Matcha Shortbread. So we thought we’d share this tasty recipe with all of you so you can try them for yourselves! 2. Beat together your butter and sugar until nicely combined (no need to get it light and fluffy – you just want to bring them together!). 3. In a different bowl, mix your Turmeric Matcha and plain flour together – sieve these into your butter mixture. 4. Stir your flour mixture and butter mixture together – get your hands in there if you need to! 5. Roll your dough out onto a floured work surface until it’s about 1cm thick, cut your biscuits into your desired shape (triangles are perfect for dunking into a cuppa!) And pop your biscuits onto a lined baking tray. 6. Stir together approximately 1 tbsp of caster sugar and 1 Perfect Matcha Spoon of Turmeric Matcha – sprinkle this over your uncooked biscuits. 7. Bake your biscuits for approximately 15 mins, they should be slightly golden at the edges. 8. Allow to cool and enjoy with a cuppa!